For the first burger on this NY trip, I had wanted to try The Spotted Pig, but that spot came with a 2-hour wait for a table. The runner-up choice for the evening was DBGB Kitchen and Bar. Tess of the B'urgervilles and I had high hopes for this spot. We scored the last table in the bar and settled in for an unduly long wait just place our orders. Once ordered, the burgers did not arrive until at least 35 minutes later. We had some catching up to do, but that was a long wait for a couple of cheeseburgers. Nonetheless, we imagined that a burgers with a Daniel Boloud pedigree and a stout $16 price tag would be well worth the wait. We imagined incorrectly. The Beef: The 6 ounce burger patties were a blend of Ribeye, Short Rib, and Strip Steak trimmings. 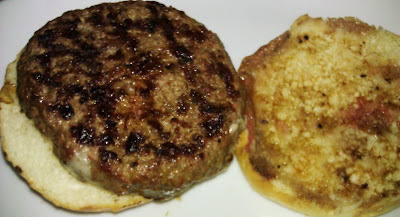 The flavor was very mild, and the burgers were pushing 30% in terms of fat content. I assumed that the Strip Steak trimmings were primarily fat. The flavor of the burger could best be described as mildly steaky. Tess remarked that it was the sort of burger that she was glad came with toppings. The beef, while fatty, was also quite juicy. There was no trace of aging, and the burger lacked notes of beefiness, which would have been appropriate. The bite was loose and yielding. The Seasoning: The burger patty was lightly seasoned with a salty blend. 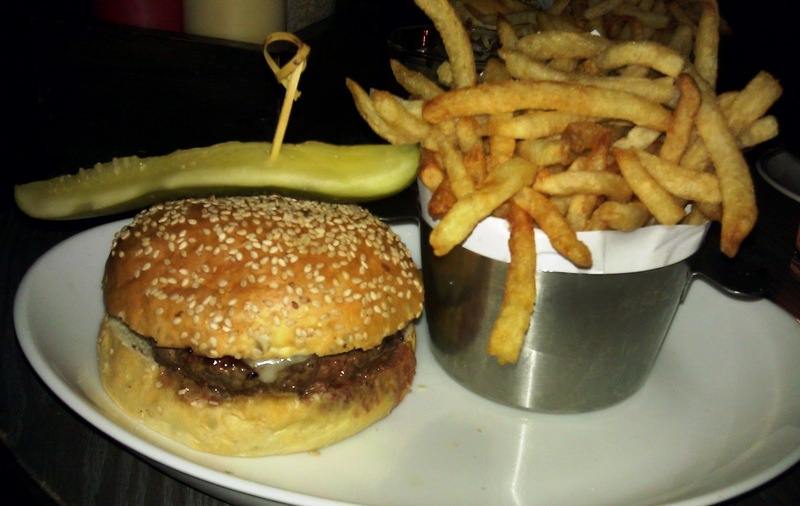 The Sear: The sear on the burgers at DBGB Kitchen and Bar was meek. These fatty, thick, juicy burgers would have benefited from a competent sear. The lackluster sear did nothing for the burger in terms of flavor or texture. The Preparation: The preparation was fine. 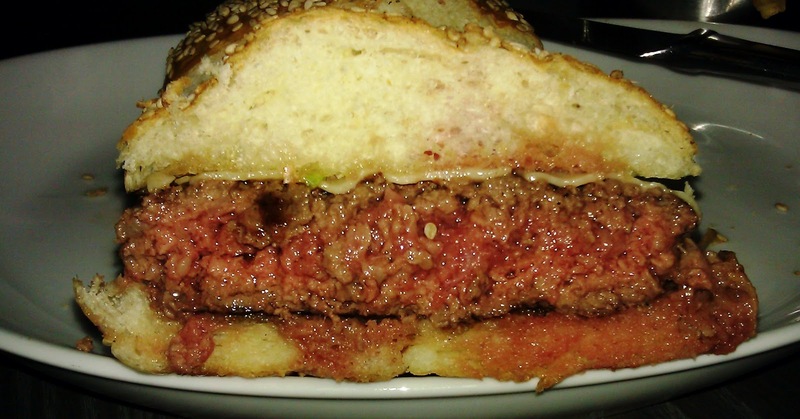 I ordered a Med-Rare burger, and I was presented with a Med-Rare burger. The beef was gently formed into patties during the day shift. The burgers were cooked on a moderately hot gas grill. The Cheese: The White Vermont Cheddar, $2 extra, was the clear winner on the plate. The Cheddar had character, but not enough to pull the dish out of the mediocre neighborhood where it was slumming. This marvelous cheese was not only shamefully over-priced, but it was also the sole item on the plate of genuine interest. The Bun: What, oh...sorry, I nodded off while thinking back on the bun. The bun was utterly devoid of flavor. It was perfectly neutral with all of the appeal, to the palate, of a sheet of newspaper. The bun was also not toasted, so it sopped up the copious grease oozing from the burger patty. The bun was a lukewarm, oily, bland mess. The Meat To Bun Ratio: This, while completely moot, was fine. The Toppings: Mine never showed up, and I didn't have the extra 35 minutes to wait on tomato and lettuce. The Fries: The first batch were mealy, lank, and barely warm--they were also fishy tasting. The second batch was crisp, unseasoned, and they had the bitter after-taste of stale fryer oil. Yech. The Value: The value must have been fantastic for DBGB Kitchen and Bar. It was miserable for me. I was most unhappy to have paid 16 bucks for slow service, an average tasting burger, and unpleasant fries. DBGB Kitchen and Bar was several years old at the time of this review, but the service and quality all spoke to an establishment in its first month of life. I was astonished that the restaurant was packed on a Monday night. Perhaps other dishes on the menu were good, but the burgers were on the low side of average. Burger Review : A shamelessly over-priced, sub-par cheeseburger was left half-uneaten at DBGB Kitchen and Bar. Ribeye and short rib is a bit redundant, and there's no need to include trimmings from another cut with all that fat. A better move would be to substitute a very lean cut. Sirloin would lower costs, but if you're charging 16 bucks for a burger, you should be using tenderloin. Hell, at that price, every burger should be ground from a Porterhouse. Now that would be awesome.